Register Now - Your Choice of 120 Summer Classes! Like most busy parents I'm familiar with the challenges of planning summer activities that are fun and infused with a dose of learning. Many experts suggest that kids should engage in learning activities that will enhance or at least maintain all that was learned during the school year. Others will argue that kids are under too much stress and should be allowed to just relax and play during the summer. So what is a harried parent to do? Get the best of both worlds at summer camps that combine fun and learning! SMC’s Community Education Department is offering a variety of summer camp courses, including Tech and Digital Arts, Mixed-Media Printing and language courses in Chinese and Spanish. And if you sign up by May 16, you can get a 10 percent discount. Parents can breathe a sigh of relief knowing that their young ones will be engaged, creative and having a good time while learning. So register now at http://bit.ly/smccamps2014. You can also call (310) 434-3400 or email commed@smc.edu. The display case in the lobby of the Bundy Building was dark, filled with dust balls, and covered up by signs and flyers taped to it. I’m happy to say that I saw an opportunity to turn that dingy display case into a brightly lit showcase of beautiful works created by our art students. We opened our mini-art gallery in mid-March, and I’m proud that SMC students and employees, as well as visitors to our building, are noticing how talented our art students are. The variety of pieces includes mosaic art, photography, life drawing, glass fusing and Japanese calligraphy. Photos include images from our “Photography at an Art Museum” tour of the Getty Villa and the “Night Lights at Santa Monica Pier” outing. One of our Japanese calligraphy pieces is a haiku, “Crows,” by Banshi. One of our glass fusing students created an unusual and lovely Chanukah Menorah. The exhibit may not be on the scale of a gallery showing, but it’s a great way to put a spotlight on the talents of our students. I am hoping to turn this into an ongoing exhibition, perhaps changing every semester to begin with. 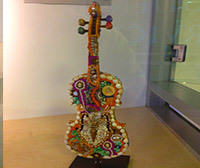 Mosaic guitar created by student Susan Bernard. My dream is that one day we will have a Community Education Student Art Exhibit in the future. Until then, please come by and visit our new display case, located just across the hall from our office. I assure you, you won’t regret it. 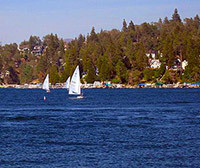 “Adventure in Arrowhead” lakeside tour and lunch is being offered this summer . and tours for the summer session, which begins June 23.
on a wide range of summer camps for youth and teenagers. Six-week summer camps for youth (ages 12 and up) are Chinese and Spanish Boot Camps. New this year are the following one-week camps: “Tech Builder’s App Design,” “Filmmaking: From Script to Premiere,” and “Animation Creations: Computer Animation.” Camps are also being offered in mixed-media printing in which students will learn to print T-shirts, pendants, posters and other items from images they choose – even photos taken on smart phones. Classes returning to the schedule are in health and fitness, computers and Internet, arts, writing, languages, music, business and more. Some courses are offered online. In addition, Community Education is offering an extensive collection of Professional Development courses in many disciplines, including business and finance, health professions, social work, entrepreneurship, and more. and a Masters of Fine Arts from Otis Art Institute Parsons School of Design in Los Angeles. She majored in Printmaking, and her master’s show was an installation created with performance art and wearable art. Gale’s Kids for Peace organization’s latest project was a Farmers Market mural created by Hancock Park Elementary School students. Most recently, through her Kids for Peace organization, she worked with 2nd graders at Hancock Park Elementary School to create a mural at the Farmers Market on Fairfax Avenue. For the project, she received a Certificate of Recognition from Los Angeles City Councilman Tom LaBonge. You’ve been taking SMC Community Education students on art tours for more than 25 years. What is that experience like for your students? I have three art tours right now. “The Underground Art Museum” tour (the next one is May 18) explores the amazing art inside and around the Metro Red Line and adjacent architectural and historical places of interest. Many participants on this tour have never been on the Metro before. For “Downtown’s Hidden Treasures” (coming up June 1), we start at MOCA then spend a day walking downtown to explore the public art and historical treasures. “Gems of Downtown: Discovery of the Senses” starts at Union Station, including the Metro Headquarters Building, and then moves to the historic La Placita (Olvera Street) with its unique museums, fantastic food, sights and sounds. When someone takes one of my tours they discover a whole new side of Los Angeles they have never seen. At the end of each tour most participants say they felt like they were on vacation discovering art and hidden treasures they have never been to or knew existed before the tour. What do you hope your students will come away with after these tours? A better understanding of the amazing and diverse culture of Los Angeles, memories of an exciting day filled with the awe, discovery of spectacular public art and historic places, and a new insight into what the city of Los Angeles has to offer. Is there an anecdote you can tell us about your tours? One time at the Universal Studios Metro stop we bumped into Margaret Garcia, who was the artist for that station. I introduced her to the group and she gave us a personal tour, sharing stories of working with architect Kate Diamond on the station and their struggle working with an all-male construction crew. This is the only station done by two women. It was a wonderful serendipitous meeting, but even when the artist is not present I share as many personal stories as I can about the making of the art – which I am able to do because I know many of the artists whose works we see. You founded Kids for Peace in 1995 and the organization has spearheaded children’s art projects all over the world. Tell us briefly about the organization and why it is meaningful. The Kids For Peace campaign was born in 1995 out of exploratory interactive mixed-media workshops in the Negev in Israel. A very moving piece of art created in a workshop by a child in a Bedouin village in the Negev triggered the concept for Kids For Peace. It depicted the Israeli flag and Palestinian flag side by side with doves and images of peace. Kids For Peace is always seeking collaboration with schools and organizations that have a similar purpose. This project is funded by individual and corporate donations and grants. It is important that the program is free to the participants and accessible to anyone. Kids For Peace workshops help to cultivate human beings to become caring creative leaders in any aspect of the private and public life. The most recent Kids for Peace project was done at the Farmers Market on Fairfax Avenue. Tell us briefly about this project. This latest mural, "The Market of Peace, Happiness and Good Health," was commissioned by the Original Farmers Market to beautify two temporary construction walls in the market. 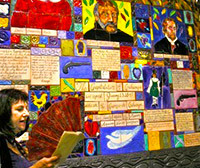 One wall consists of 45 painted luan wood tiles, 1 foot by 1 foot, created previously by myself with participants from the U.S., orphans from Brazil and local villagers in Chaulittle, Peru. The other wall has 80 painted tiles that were recently created by myself with Hancock Park Elementary school 2nd graders from the classrooms of Susan Cook, Donna Perfors and Christine Chipres. Workshops were held onsite at the Farmers market in February, and the mural was officially unveiled in March. CBS Los Angeles aired a great report on the project. What media do you practice individually? Do you have a favorite? My favorite medium is the one that serves the intention of the project the best. I work in many media, such as painting, mixed media and printmaking, using the computer as a means for printing the images. One of my passions is creating autobiographical collage mixed media art books, many of which I created during visiting artist residencies in Israel, Spain, Peru and Brazil. I was passionately inspired to create these while conducting Kids for Peace mural workshops with homeless children in Bahia. Brazil. I felt I had penetrated the secret world hidden within the Brazilian subculture and was transported to a mystical world filled with a rich folk culture. One of these art books, "Bahia, Brazil," is featured on the Art Bridges Gallery website. Which artists, famous or not, do you admire the most? Why? My biggest mentor is Oskar Schlemmer, the Master of Form at the Bauhaus theatre workshop in Germany. In graduate school I was fortunate to see a rare live performance of his spectacular "Triadic Ballet." The costumes turn the dancers into living sculptures that left me speechless. His work was a major inspiration for my own work for years to come. The Russian Avant Garde with artists such as Papova and Stepanova also had a huge influence on my work. I was drawn to their amazing revolutionary wearable art and performance art on the streets of Russia at the turn of the 20th century. Niki de Saint Phalle is another favorite of mine with her innovative whimsical and colorful sculpture of women. I have fallen in love with her work, especially her Gaudi-inspired Tarot Garden, Giardino dei Tarocchi, in Italy. The list goes on and on, as there are so many artists I admire. Every single L.A. artist who has completed a Metro station public art project has my praise! The artists I admire most are the ones who have pushed boundaries, taking art out of the gallery and into our everyday lives. Gale spearheaded “My Movie: Portraits of My Neighborhood,” a mural created by Culver City students for Sony Pictures Entertainment. You have directed numerous outreach art projects in L.A. for Sony Pictures, Fox Studios, Hollywood Arts Council, and the Craft and Folk Art Museum. Tell us about one or two of these. The most prestigious project was the Sony Mural Project, “My Movie: Portraits of My Neighborhood,” which was a community-based public art project conceived and directed by myself/Kids For Peace. Fifth-grade students from several Culver City area schools created 36 canvases, 3 feet by 6 feet, for Sony Pictures Entertainment in Culver City. I brought in several artists-in-residence and two resident storytellers, and we worked with students and teachers to create a "film storyboard mural.” Some of the panels were donated by the schools to Sony and are on display in the lobby of the Sony Pictures Entertainment Plaza Building. One of the most rewarding projects was the “World Music and Masks Artist in Residence Program” at Barry J. Nordorf Juvenile Hall in Sylmar. Youth from the facility made magical masks and instruments from found objects and created a musical performance and recorded a CD. These hands-on sessions exposed students to the joys of self-expression most of them never knew existed. The stimulating environment provided tools for the development of positive life skills, self-esteem and discipline, along with encouragement for internal discovery and personal growth. Join Gayle on one of her tours, and be inspired.